Make this the month you learn how to stop the violence. The newest national statistics for domestic violence homicides over the past 32 years were officially released at the Silent Witness Initiative's March to End the Silence vigil on the campus of Roger Williams University in Bristol, Rhode Island on October 1, 2014. Our hope is that they will be used by the public to further discussion on ways to end domestic violence homicides in each state in the US. Special thanks to those dedicated volunteers who diligently conducted the research to find the FBI data and disseminated the figures to help us understand the extent of intimate partner homicides in the USA. We believe that it's important to periodically review the current FBI data collected from around the country. The data collection helps us see where there are greater needs for education, awareness and healing programs. We are most thankful for all the work of Nicole Nelson, Masters Candidate, Smith College School for Social Work, who went through to collect all the FBI statistics. 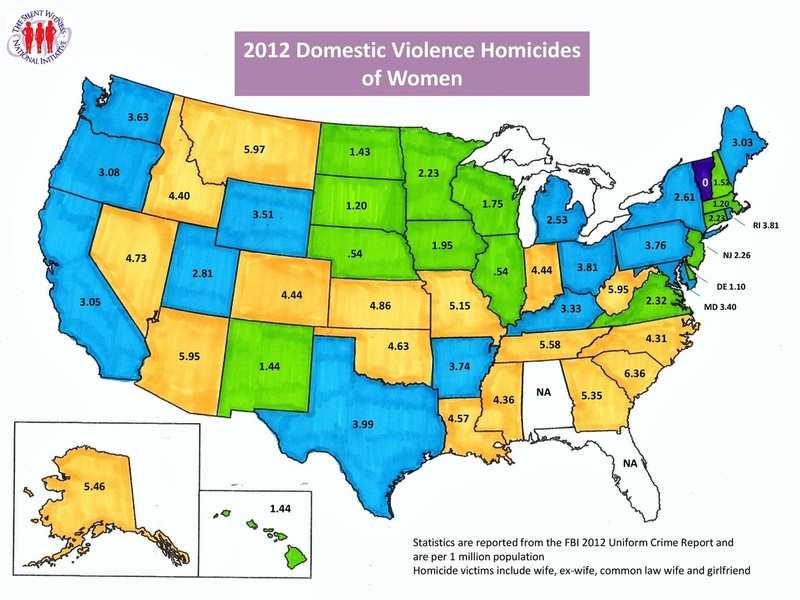 We have included maps from 1998, 2003 and 2012 (see below) of the United States that show statistics of domestic violence homicide rates for women. All statistics are per million population, as cited by the FBI in its Supplemental Homicide Report. We use data and state comparisons to let everyone know how we are doing, to give hope to the country by showing that success in reducing domestic violence homicides is possible, and to encourage more states to take on significant projects that will reduce their domestic homicide rates for women. We realize different programs work in different cities. And we are eager to hear about new programs that are working so we can publicize them to others. What are the weaknesses in using data to track domestic homicides of women? These data depend on police reporting homicides to the FBI. Each year more police departments report but we do not know if it is not known if all the sources report all of the murders. The FBI has stated that the data they collect is 92% accurate. We chose to use only one statistic, representing a definition of intimate partner violence, which we could compare across states so at least the comparisons would be accurate. This is the definition of intimate partner violence that the Department of Justice uses. The data we collected represents the number of females eighteen and over murdered by intimate partners (husband, ex-husband, common law husband and boyfriend) per year in each state. By using that base line number consistently across states the trend in domestic homicides of women is declining. These statistics are the best, most accurate data available on a consistent basis across all states. But keep in mind, this is the only one nationwide attempt within the domestic violence movement to compile this data over so many years, and so there are bound to be some inaccuracies. Data will continue to be collected over time and updates will be uploaded to the website.